(VEN) - The industrial sector maintained good growth in the first 10 months of this year as the production index increased rapidly against the same period in the last two years, while inventories and sales were positive. According to the Ministry of Industry and Trade, industrial production continued to grow in the first 10 months of this year. The power and water production and supply, and the manufacturing and processing sectors continued to be highlights, contributing tremendously to the general growth in the industrial sector. Sales increased fairly well, while inventories remained at a low level when compared with a year ago. The Ministry of Industry and Trade also said the industrial production index for the first 10 months of this year increased by 9.7 percent from a year ago, compared with 6.9 percent in 2014 and 5.4 percent in 2013. The power production and supply, and processing and manufacturing sectors grew the fastest by 11.5 percent and 10 percent, contributing greatly to the general growth in the industrial sector. The leather and footwear industry was one of the highlights in terms of production growth. Leather footwear production reached 259 million pairs in the first 10 months of this year, an 18.1 percent increase from a year ago. 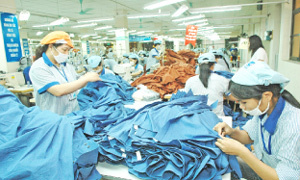 According to the Vietnam Leather, Footwear and Bag Association, the leather and footwear sector usually increases production in the last quarter of the year to meet usual seasonal demand. Sales in the processing and manufacturing sector also boomed increasing by 13.1 percent in the first nine months of this year. 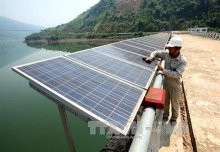 Several sub-sectors achieved high growth such as electronics, computers and fiber optical cable products increasing by 53.8 percent, motorized vehicles up by 27.6 percent, and metal up by 23.2 percent. Inventories in the processing and manufacturing sector were maintained at a low level. By October 1, the inventories index increased by 9.8 percent, a 1.1 percent point fall from the same period last year. Of these, several industries enjoyed a sharp decline in inventories such as tobacco falling by 30.1 percent, and paper down by 8.5 percent. To maintain the growth momentum in the months to come, the Ministry of Industry and Trade asked local departments of industry and trade and its subsidiary agencies to continue comprehensive measures to resolve difficulties for businesses, implement major tasks to improve the business environment and sharpen the national competitive edge, connect domestic and foreign markets and provide market information and analysis to boost sales, particularly in terms of agricultural products and seafood. Related agencies also need to get together with the Ministry of Finance to improve the campaign against smuggling, trade fraud, counterfeiting and substandard goods during the year-end, while tightening relations in inspecting food safety and hygiene to prevent poultry and cattle smuggling. Groups, corporations, enterprises and administrative agencies under the Ministry of Industry and Trade need to intensify investment in major national projects and key projects in the industry and trade sector to put them into operation in a timely manner to build new production capacity and contribute to growth in 2016 and future years.